On October 30, 2018, JALBCA presented a program co-sponsored by the New York Women’s Bar Association on “Treatment Beyond the Tumor”, directed to the emotional effects on the patient during and after treatment. 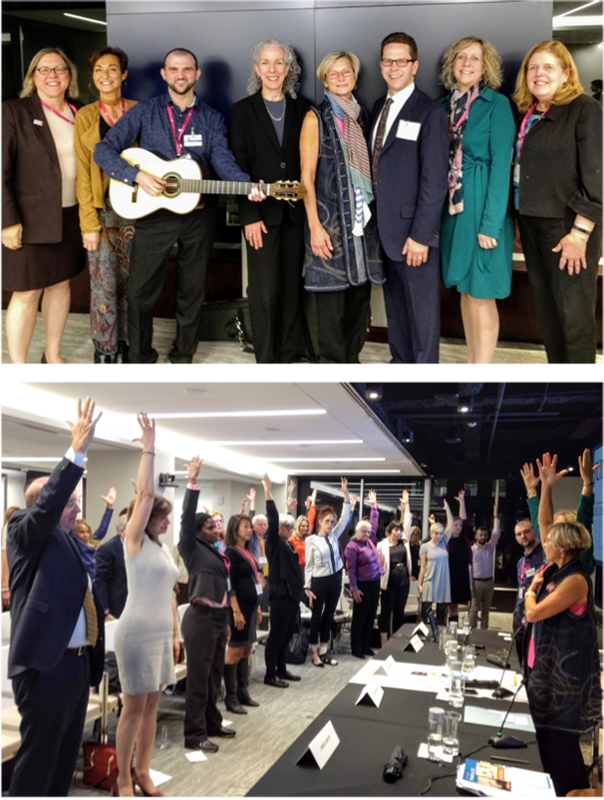 The program addressed treatments – including counseling, exercise and music therapy – to help patients with the emotional side effects of cancer. It was preceded and followed by a networking reception hosted by Alston & Bird LLP. The program was moderated by Linda Capitti, Esq., Principal Court Attorney, Integrated Domestic Violence Court and member of the JALBCA Board of Directors. The four presenters included Susan Glaser from Memorial Sloan Kettering Cancer Center (MSKCC), Donna Wilson (MSKCC), Joanne V. Loewy (the Louis Armstrong Center for Music & Medicine Mount Sinai Beth Israel) and Christopher Pizzute (the Louis Armstrong Center for Music & Medicine Mount Sinai Beth Israel). Susan Glaser explored a range of emotional reactions by people diagnosed with cancer. She explained that after diagnosis, anxiety persists through treatment and thereafter. Many people also are angry and search for a cause outside themselves – for example, the supplement industry, or they express regrets that take the form of “if only….”, for example, “if only I had been vegan”. She sees a lot of de-personalization as well with cancer patients who describe themselves as seeing their lives from above or from afar, as in watching a movie. She explained that the diagnosis is a threat to mortality and increases a sense of vulnerability and betrayal, especially when someone watched their diet, exercised, went regularly to their religious institutions, etc. Ms. Glaser also explained the experience of losing control. This includes a concern for patients’ relationships (e.g., what do I tell my kids? my partner? my employer?) and a fear of loss of clients for those who might not want to invest in the professional relationship if the service provider will be out sick. In her experience, patients are surprised both positively and negatively by the people in their lives. Ms. Glaser also called attention to the great impact of celebrity personalities who disclosed their cancer diagnoses – for example Betty Ford, Happy Rockefeller, Christine Applegate, Richard Roundtree, Ann Romney, Angelina Jolie, and Olivia Newton-John. This makes it easier for the patient, in turn, to disclose her own condition. There is an alteration in body image that often accompanies cancer treatment. Both men and women can feel deformed, experience an interruption in sensation, suffer an adverse impact on fertility, and have a general feeling of loss. She, therefore, recommended that it is important for patients to shore up their support systems. Donna Wilson, who looked like the paradigm of physical fitness, focused on techniques to help the patient – acupuncture, massage, reiki, mind-body meditation and exercise. Exercise, she explained, is anti-inflammatory and fat increases cancer risks so fat reduction is a goal. Ms. Wilson emphasized hydration and the need to drink three liters per day. She then walked the audience through an exercise and breathing regimen which should begin daily upon wake-up. This took everyone out of their seats for a welcome dose of audience participation. Joanne Loewy described the use of music therapy in cancer care. Music therapy, defined by the American Music Therapy Association, is the clinical and evidence-based use of music interventions to accomplish individual goals within a therapeutic relationship by a credentialed professional who has completed an approved musical therapy program. She explained that the body is an orchestra and we control the orchestra. The first thing doctors do is listen to our drummer (i.e., our heartbeat). The Louis Armstrong Center for Music & Medicine, named after the performer who was one of the first great stars to donate his music proceeds to this cause, uses music to build resilience. The staff assesses what music will be of assistance to the person in question. Ms. Loewy herself was able to avoid taking heparin, when she was sick, by using music. They also offer a wellness clinic for people who are cancer-free. She identified the use of music in cancer care for these purposes: music-assisted relaxation, de-stress prescribed music playlists, strategies for coping with illness burden, emotional support, symptom management, anxiety reduction, pain management, and procedural support therapy. The music therapists at the Center at Mount Sinai are licensed by the NYS Department of Education and are trained at the Masters and Doctoral level in current techniques in music psychotherapy. recommendation to have at least a one-time consultation with a music therapist to learn what it can offer. Finally, Christopher Pizzute closed the program by demonstrating the power of music therapy with his guitar. 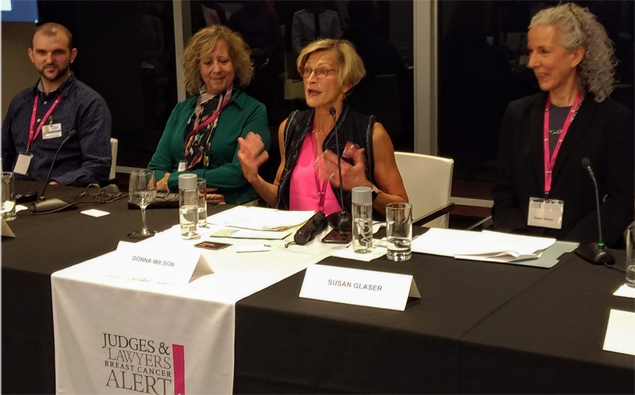 JALBCA presented a fascinating and participatory program on Treatment Beyond the Tumor on October 30, 2018, at Alston & Bird LLP, moderated by JALBCA Board member Linda Capitti and co-sponsored by the New York Women’s Bar Association. On October 18, 2018, the Jewish Theological Seminary hosted a program on genetic cancer mutations in Ashkenazi Jews. At the start of the program, it was noted that those of Jewish ancestry have a 10 times greater risk of inheriting the BRCA gene mutations; 1 out of 40 carries the mutation, thereby increasing her/his risk for breast, prostate and ovarian cancers. Reference was made to the BRCA Founder Outreach Study. Its purpose is to expand knowledge of the BRCA mutations, motivate people, and give access to testing in the Ashkenazi community. The program was introduced by a rabbi who was a breast cancer survivor, who learned she had breast cancer while preparing for a prophylactic mastectomy, though she had completed a mammogram two months earlier. The first speaker was Dr. Ken Offit from Memorial Sloan Kettering Cancer Center (MSKCC). He discussed the general risk of cancer in Jewish individuals. He mentioned that he did not see stage one ovarian cancer until he did BRCA testing and noted such tumors can be cured if they are removed early. In speaking about breast cancer, Dr. Offit explained that, while this is not a Jewish disease, the hereditary basis for this cancer is more common in Jews. He discovered a number of mutations other than BRCA that cause different cancers because of the hereditary burden Jews have. The term “genetic burden” has been defined as (1) the number of diseases and deaths that occur as a result of inherited traits or (2) the cost to the genome of mutations or selection pressure that eliminate alleles from it. In Jewish history, there was a series of population-threatening events that extended from the 2nd and 3rd centuries AD to the 1700s, as well as occasions when Jews were prohibited from reproducing except with other Jews. This increased the passage of genetic mutations to future generations. What can men and women do with respect to BRCA mutations? Dr. Offit offered both MRIs and preventative surgery (as was pursued by the actress Angelina Jolie) or breast conservation surgery as options. In addition, for young people of reproductive age, one can avoid the BRCA mutation by doing assisted reproduction, e.g., in vitro fertilization. Dr. Offit said he learned this from the Israelis, who he said do a lot of IVF. The next panelist was a New York radiologist, Dr. Miriam Levy, the founder of a women’s medical imaging clinic. She focused on radiologic screening of people who are genetically at risk. She started by discussing the types of breast cancer (ductal carcinoma in situ (DSIS) and invasive types). Invasive types are those where abnormal cells multiply in an uncontrolled fashion while infiltrating the breast. These become life-threatening when the cells trail through the bloodstream and lymphatic channels. As to DCIS, Dr. Levy explained that this does not cause harm and sometimes fizzles out. However, DCIS sometimes develops into an invasive cancer, though the medical community is not sure how many and which kinds follow this path. Dr. Levy believes DCIS should be classified as a high risk lesion, but described her position as a minority one. Unless people undergo prophylactic bilateral mastectomies, Dr. Levy said the best option is screening. Radiologists offer mammograms – the 2D mammogram uses low dose radiation and is the gold standard for screening. It has produced a 30-40% reduction in death from breast cancer compared to women who are not screened. The greatest challenge is breast density – the more dense the breast, the more glands exist compared to fat – and breast cancer is harder to detect in this white background. To overcome the breast density issue, radiologists use 3D mammography where the images separate the breast into slices similar to CT scans and MRIs. 3D mammography, Dr. Levy said, can be credited with finding twice as many invasive breast cancers and resulting in significantly fewer false positive results. Needle biopsies of the breast are also done using this new technology to get accurate tissue diagnosis. These are needle-guided; the usual biopsy with 2D technology will not suffice. Dr. Levy also described the use of breast sonograms, which involves the use of high frequency sound waves to produce images. With this, she is able to distinguish fluid from solid tissue and avoid exposure of the patient to x-rays. The downside of sonograms is that many centers have a high false positive rate. In her practice, she uses sonograms especially for those patients who have dense breasts and chest deformities. MRIs are another tool. This involves the use of a very powerful magnet, radio waves and computer technologies to produce thinly sliced images of the breast. 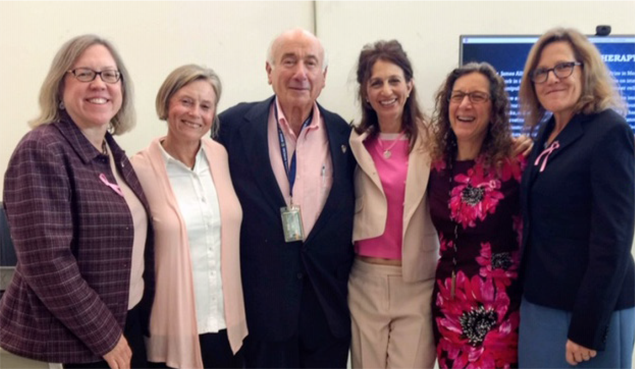 Dr. Levy explained that gadolinium-based contrast agents (GBCAs) light up cancer in the breast. It has a very high level of sensitivity to find breast cancer, the ability to distinguish liquid from solid tissue, does not expose the patient to x-rays, and provides excellent anatomical detail. GBCAs are intravenous drugs used in diagnostic imaging procedures to enhance the quality of magnetic resonance imaging (MRI) or magnetic resonance angiography (MRA). GBCAs are rare earth metals. Dr. Levy identified the disadvantages of MRIs as these: they are expensive, some people are claustrophobic and cannot tolerate them, the gadolinium injection imposes some small risks (e.g., with multiple repeated injections it stays in the brain; also there are some sensitivities) and it is less accurate in younger women and women with hormone replacement therapy. (See the article in this JALBCA newsletter for further information about gadolinium.) The result can be a camouflage effect and false positive findings that lead to more studies. Dr. Levy briefly mentioned other available techniques for radiologists: MBI (molecular breast imaging) and PEM (positron emission mammography). Both require injection of a radioactive substance, making them not reasonable choices for screening. She provided some recommendations. For women with BRCA mutations and untested first degree female relatives, she recommended timing the tests six months apart, having annual mammograms and breast sonograms in combination. She acknowledged that the quality of care a patient gets in radiology depends on the excellence of the equipment, skill of the radiologist, diagnostic skill of the radiologist interpreting the exam and judgment of the radiologist deciding what to do about the radiologic finding (e.g., whether or not to recommend an image-guided needle biopsy). Also, in her practice, Dr. Levy has two radiologists look at a patient’s results. For men who are BRCA carriers, Dr. Levy noted that they have a lifetime risk to develop breast cancer which is lower than the average woman but higher than the average man. Dr. Levy also touched on approaches to gynecological cancers for women with the BRCA mutation. The ovaries and fallopian tubes of women are most at risk. The cancers develop mostly in the fallopian tubes and the uterus is usually spared, except secondarily when a woman is being treated for breast cancer with tamoxifen. Ovarian cancer, she explained, tends to grow rapidly and manifests symptoms much later in its progression and cannot be found early enough with screening. Laproscopic surgery can be done by age 35-40 for BRCA1 carriers and age 45-50 for BRCA2 carriers, hopefully after they have borne children if they choose to do so. Ovarian cancer poses challenges for younger women. Clinical trials are underway where only the tubes are removed. Dr. Levy also explained that the risk of ovarian cancer is reduced by 40% if these women are put on birth control pills. She also recommended a trans-vaginal sonogram plus CA125 blood test every six months. In concluding, Dr. Levy shared that, even with all her years in the field of medicine, she is always learning and changes her way of practice to do better for her patients. But the more she learns, the more humbled she feels by what she does not know. The third speaker was Dr. Michael Bertstein, whose topic was “BRCA Screening in Men: Is it Worth the Effort?” Dr. Bertstein is a head and neck cancer surgeon, ENT doctor and prostate cancer survivor. Speaking about his own experience, he knew that if he did not have successful radiation therapy he faced no alternative treatment. He referenced the silliness of the recommendation of the American College of Surgeons to not get screened because once you get the results they don’t know what they’re going to do about it. So men get a PSA test and the decision is the patient’s, not that of the internist or urologist, as to how to proceed. For men who are BRCA positive, he said the cancer is significantly more aggressive. That cancer’s behavior is not the same as it is for the general population. There is a Gleeson Score, and if a man is BRCA positive he is starting at the minimum of “7”. So, he said, if you then do not get treated your “prostate cancer will definitively kill you.” A BRCA test is extremely important for a man’s survival, and the testing may change the prospects for his offspring and theirs as well. Dr. Bertstein believes he must give the patient hope. Routinely he tells his patients that he is a cancer survivor and they feel relief when they see their caregiver is a survivor and has done well health-wise. Further, he offers his patients a concrete plan as to what is going to be done to make them better. The final speaker was Lenny Pogrebin, the founder of Ms. Magazine. She explained that she is nine years away from the day when she was told “the radiologist would like to see you,” which she said put her into the “world of the sick”, where suddenly “it is all about you.” As a journalist, she was fanatical about research and so she did her research, spoke to friends (and, being an Ashkenazi Jew, she had many friends who had experienced the same situation), and went to MSKCC for treatment by Dr. Larry Norton. She emphasized the importance of interviewing your doctors in order to determine if they relate to you as a human being. Ms. Pogrebin had a “good cancer” because it was a tubular carcinoma and could be treated with a lumpectomy and six weeks of radiation without chemotherapy. During those six weeks, she read about how to deal with her friends because they were disappointing her – they were not bringing her presents that had any purpose (e.g., they brought bouquets of flowers that would die on the window sill and cellophaned food baskets). Instead, she would have liked a massage or someone to ask her what she had a yen for (e.g., lamb chops and brownies). On the internet, she looked up friendship and illness in order to get her friends to be more responsive or “useful” because, while they wanted to be helpful, they missed a step. She found that online books were geared to young adults and children and concluded that she needed to write the book that she would like to read. She found her sample of people in the waiting room – people with all different diagnoses. Her selected topic was “how to be a friend to a friend who is sick.” She collected anecdotes – “anecdotes are evidence” – they tell you about the person and friend, what was useful and what was not, and she developed categories of usefulness. One category was “visiting” a patient. Ms. Pogrebin recommends that visitors be sensitive to the patient’s condition at the time of the visit. For example, be careful sitting on the edge of the bed if this might hurt someone with a scar; don’t walk in with coffee breath or garlic breath; don’t say “you look great” – she doesn’t ever want to hear this statement again; and never say “oh my god” (she took it as “oh my god, are you going to die?”). The program was followed by a short question-and-answer period. The use of GBCAs has been the subject of recent debate among radiologists, arising from a study in late 2014 that showed the agent is deposited and retained in the brain. At the November 2017 Radiological Society of North America meeting, the topic of gadolinium deposition and possible effects of gadolinium toxicity were discussed. There is apparently no dispute that patients with renal insufficiency cannot filter the gadolinium from their body. It seems there has been little evidence showing patient safety issues in those with normal renal function. Boxed warnings are also included for known hypersensitivity reactions that can occur, especially in patients with allergic disorders. Public attention to side effects was raised in November 2017 when action movie actor Chuck Norris filed a lawsuit against a contrast vendor and the contrast distributor for allegedly poisoning his wife Gena. She had several contrast MRI exams and the suit alleges numerous adverse health effects began after these exams. Norris alleged that his wife contracted what he called “gadolinium deposition disease”. The term is often used by patients who claim they now have chronic health problems from their contrast MRI exams, but it is not a term accepted by many in the medical community. While GBCAs have been used for decades, the fact that it accumulated and was retained in tissues, apparently, was not widely known until recently. Clinical research continues concerning the safety issue. The FDA has taken certain action concerning gadolinium safety. In September 2017, the FDA’s Medical Imaging Drugs Advisory Committee (MIDAC) voted overwhelmingly to recommend new labels on GBCAs warning of the possibility of gadolinium retention in the body. In December 2017, the FDA announced in a drug safety communication it is requiring these new warnings to be included on all GBCAs. The FDA concluded that, “(t)o date, the only known adverse health effect related to gadolinium retention is a rare condition called nephrogenic systemic fibrosis (NSF) that occurs in a small subgroup of patients with pre-existing kidney failure. We have also received reports of adverse events involving multiple organ systems in patients with normal kidney function. A causal association between these adverse events and gadolinium retention could not be established.” By contrast, in July 2017, the European Medicines Agency (EMA) issued a final opinion that recommended restricting the use of some linear GBCAs and suspending the marketing authorizations of others, citing concerns about gadolinium deposition. Patients who allege they were harmed by gadolinium agents often argue they were not provided with informed consent documents to sign, warning them of gadolinium’s potential hazards. Radiologists argue, however, that the main reason the documents may not be used is because the majority of clinical data on GBCAs show they are safe. One radiologist argues that medical malpractice attorneys have advised him that they cannot acquire informed consent if all the doctor is telling a patient is that there are no known risks, but no one knows what will occur in the future. While some practices are looking into informed consent documentation, others want to avoid this out of concern it may invite litigation. Team JALBCA, led by team captains Hon. Shirley Kornreich and Sandy Lespinasse, participated in the Susan G. Komen Race for the Cure in Central Park on September 9, 2018. Fran Visco, President of JALBCA grantee the National Breast Cancer Coalition, presented a captivating program on “Understanding the Basics of Breast Cancer” to a packed room on October 16, 2018. The event was hosted by JALBCA Board member Hon. Marguerite Grays and co-sponsored by the Queens County Supreme Court, Civil and Criminal Term Gender Fairness Committee and the Queens County Women’s Bar Association. Many women judges from Queens turned out to welcome Fran to the Queens County Supreme Court. 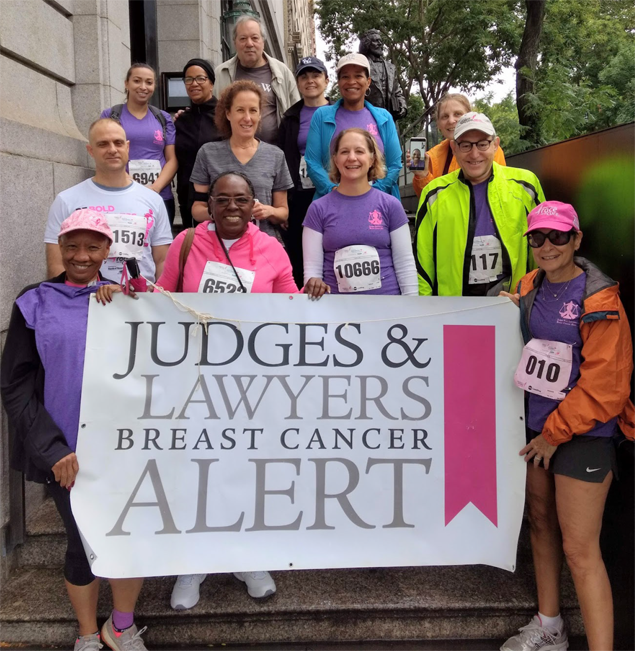 On October 18, 2018, JALBCA was proud to partner with the Westchester Women’s Bar Association in presenting “Breast Cancer Awareness” in White Plains, NY. JALBCA co-founder, past Co-President and Board member Hon. Sondra Miller spoke about JALBCA and welcomed attendees to an interesting and informative presentation about breast health, risk factors, diagnosis and treatment options by Dr. Alisan Goldfarb, a renowned breast cancer surgeon, and Dr. Randy Stevens, Director, Department of Radiation Oncology, White Plains Hospital Cancer Center. They were joined by WWBA President Kim Berg and WWBA Board member Sandra Forster. JALBCA Board member Hon. 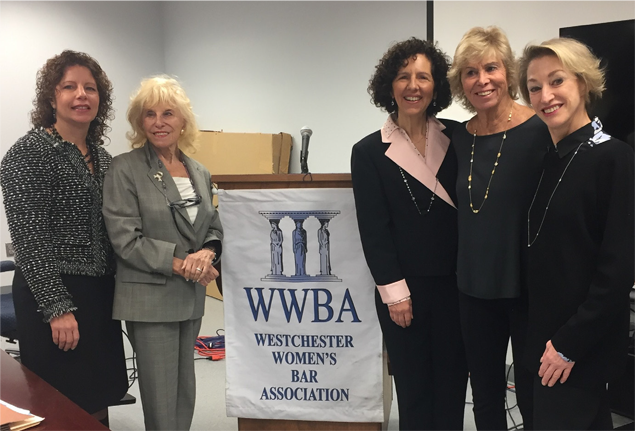 Leslie Stroth and Executive Director Claire Gutekunst joined Lisa Licata, President of the Bronx Women’s Bar Association, and event organizer Lisa Waller for the BWBA’s annual JALBCA Luncheon on October 25, 2018. The program featured breast cancer survivor Detective Stanley Schiffman and Allison Estabrook, MD, Chief of Breast Surgery, Mount Sinai West.